Added on January 10, 2019 by Cathie Ugrin. Living with mental illness is a journey and a process. An emotional and physical roller-coaster that includes and involves loved ones, family and friends. In this artist talk, local fabric artist Cathie Ugrin presents her own experiences as a case study and talks about how the creation of her solo fibre art exhibit Feeling from Without and Within uses art as a release and a means to understanding. 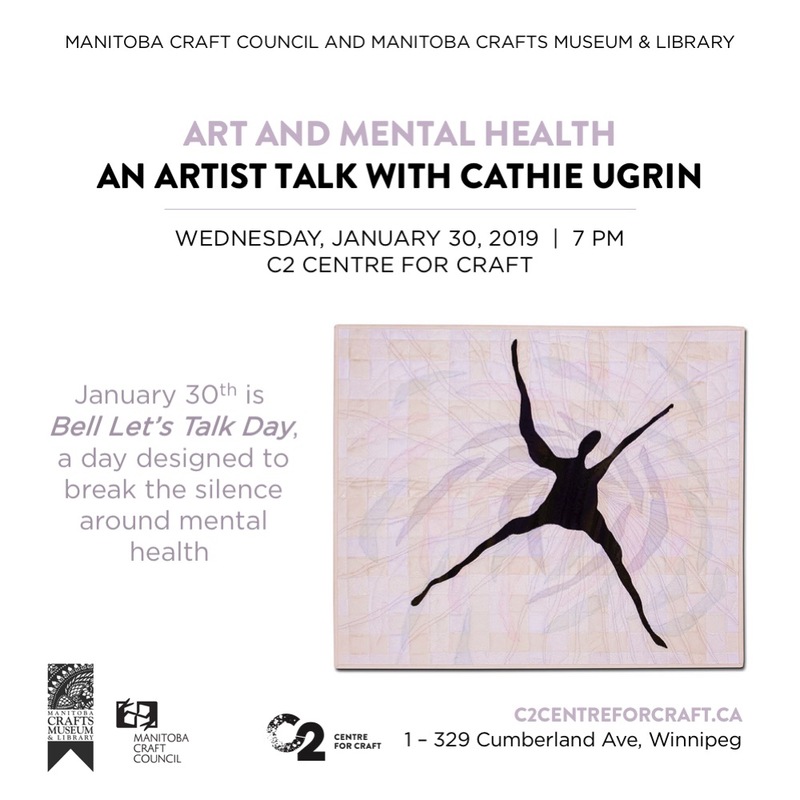 Join her on January 30, 2019 7 pm at C2 Centre for Craft as part of Bell Let’s Talk Day. Cathie Ugrin is the recipient of the 2019 Manitoba Craft Council Bursary Award. The funds will used for her travel to Quilt Canada 2019 and studies there with Amanda McCavour. The Bursary will be awarded at the MCC’s Annual Member Show ‘For the Love of Craft’ on January 11, 2019. Added on October 31, 2018 by Cathie Ugrin. Added on August 31, 2018 by Cathie Ugrin. Gazing out at the pristine sparkle of an unblemished January snowfall. Experiencing the joy and wonder of a new discovery. Peering into the cavern of madness. These are examples of the many feelings and emotions explored through fibre and colour in Cathie Ugrin’s upcoming solo show ‘Feeling from Without and Within’. Taking place at the 12th Street Gallery/ Studio/ B&B in Brandon, MB during September and October 2018. Come meet Cathie, experience the artwork and enjoy refreshments on Friday, September 7 from 7 – 9 pm at the show’s reception. Added on June 12, 2017 by Cathie Ugrin. Added on September 21, 2016 by Cathie Ugrin. My quilt 'Sea at Storm' will be exhibited at the La Conner Quilt and Fiber Arts Festival in La Conner, Washington on September 30 - October 2, 2016. My quilt 'Listen Softly' has been selected for this year's Fibre Art Exhibit at the 2016 Manitoba Fibre Festival (Friday, September 30 & Saturday, October 1 at the Red River Exhibition Park). Added on April 24, 2016 by Cathie Ugrin. Featured Artist at the 2016 Mennonite Central Committee Annual Quilt Show. Added on August 2, 2015 by Cathie Ugrin. Cathie Ugrin is one of fifty artisans selected to show and sell recent work (primarily small and medium pieces of Wall and Table art). For more information, please email cathie.ugrin@gmail.com. Added on August 25, 2014 by Cathie Ugrin. A Cathie Ugrin quilt will be part of the MCC Raffle in January 2015. Added on August 17, 2014 by Cathie Ugrin. Two new large-scale quilts will be exhibited and available by raffle at the 2014 Cluster: New Music + Integrated Arts Festival in Winnipeg from March 1-9, 2014. Two of my quilts, Opulence and Love on the Martian Surface, are part of the Manitoba Craft Council’s upcoming exhibit For the Love of Craft running February 7-18, 2014 at the CRE8ERY Gallery in Winnipeg.